It is known to all that PHP is a power full tools in web development. It is must need for creating interactive and dynamic web site. on the other hand php is most widely used efficient and free alternative to competitors like Microsoft’s ASP. Dear Learner in this tutorial i will discuss how you can learn about PHP and how to execute php or php scripts on your server/ Local host. If you feel that you will need to understand /know about above three subjects then you can check out this tutorial Home page. 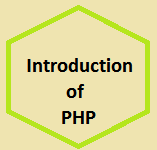 Before going to learn PHP we should know What is php? Firstly: PHP means Hypertext Prepossess. Secondly: PHP is a server side scripting language. Thirdly: PHP is a Scripting language which is executable on the server. Fifthly: PHP is a open source software and free to download from internet. 1. PHP helps for creating interactive and dynamic web site. 2. Easy to learn and efficiently run on the server side. 4. Compatible with almost all servers Like: Apache, IIS, etc. 5. Runs on different platforms such as : Linux, Windows, Unix, Mac Os etc. What is PHP File and where to start ? It is most important to know about php file and from where we have to start. 2. Php file must have to keep on the htdocs directory for run on the web browser. 4.PHP files contain HTML tags scripts and text. 1. Have to Install Apache( XAMPP) or IIS on your computer for creating local server. 2. Or You can find a web hosting with MySQL and PHP support. Above two way 1 No is easy then second so i will advise to use 1 No way for starting with PHP.